This is a particularly collectable vintage Calatrava. 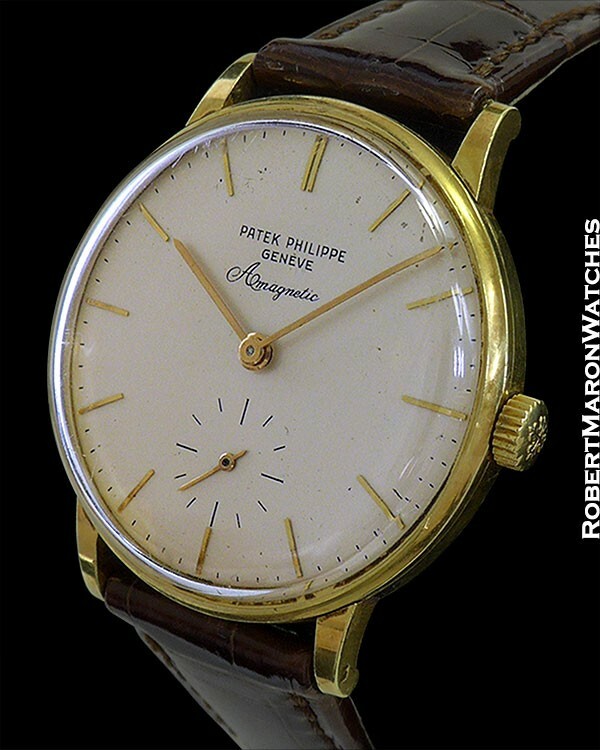 First of all, it has the desirable “Antimgnetic” signed dial with ‘Patek Philippe Geneve’. Second, this unassuming and never polished 18k Calatrava has Patek’s advanced anti-magnetic movement inside. Unpolished case is 18k gold with dimensions of 34mm diameter by 9mm thick. Crystal is domed acrylic. The lugs curve downward. Case proudly shows its wear but is with full, undiminished metal. Snap case back in solid 18k gold with deep hallmarks. Dial is original and untouched, silver with applied baton hour markers and original baton hands. There is a subsidiary seconds dial. Movement is the Patek Philippe manually winding Caliber 27-400AM with 18 jewels, gyromax balance adjusted to heat, cold, isochronism and in five positions, and is stamped with the Geneva Seal. 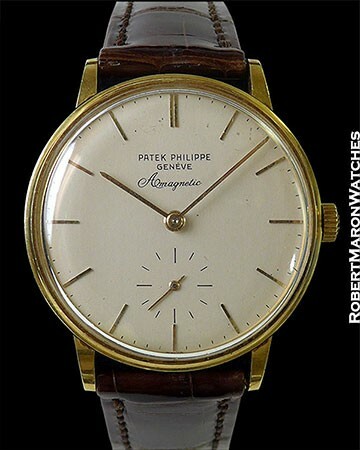 Watch is from circa 1965 and will be delivered on modern Patek Philippe strap with 18k vintage tang buckle.